This new edition provides a state-of-the-art introduction to psychology that merges the rigor of science with a broad human perspective. All the Myers’ hallmarks are here—the vivid presentation, intense attention to detail and currency in the field, research-based study aids and media learning tools, and above all, the inviting, authorial voice of David Myers that speaks to the life experiences of all kinds of students. "ordered new book, came in cellophane wrapping"
Exploring Psychology is, overall, a really good introduction to basic psychological concepts. The book covers some of the more important topics in the field and is a good way to introduce new students to the course work they can expect over the next 2-4 years. The subject matter is presented in a way that is fairly easy to understand without making the reader feel like a simpleton or a child by using overly complicated words, but it still maintains a sense of intelligence that does not insult it's target audience either. The author demonstrates a very clear understanding of the topics at hand and remains objective and unbiased throughout- at no point do you feel as though a personal bias is influencing the writing. All that being said, the book is not perfect. Some topics are covered in depth, but others feel rushed and kind of glossed over. This isn't a deal breaker since the book is best used as an introduction to the course work any way, but it does seem odd to spend so much time on some areas while all but ignoring others. The chapter organization can be confusing at times- some topics which seem a bit complex are introduced before other easier to grasp topics. The chapter length is mostly standardized but in some cases the publishers have sacrificed information for pictures which aren't particularly helpful. Overall the book is very solid and serves as a great way to introduce new students to the psychological field. The few flaws are easily overlooked. 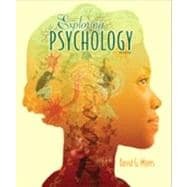 Exploring Psychology: 4.3 out of 5 stars based on 3 user reviews.